The court considered five charges leveled against the president.3 In the end, the court rejected the charges regarding improper dismissal, violation of free press, failure to protect citizen lives, and fair implementation of duty as public servant. But it did find significant overreach in executive authority by sharing confidential information with a private citizen and denying connection with this individual, who was personally involved in state affairs. On the charge of bribery, the court was silent. 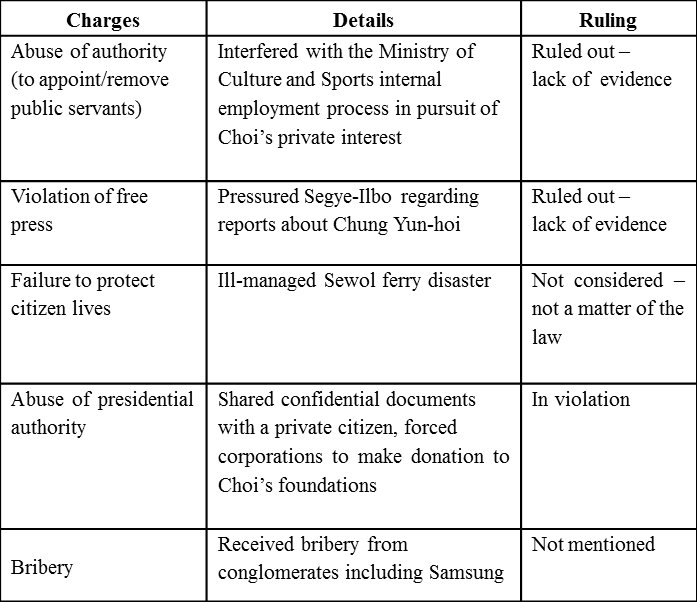 It remains to be seen how the ruling may influence the ongoing trial against Lee Jay-yong. All eyes and ears in South Korea were focused on the ruling this morning. 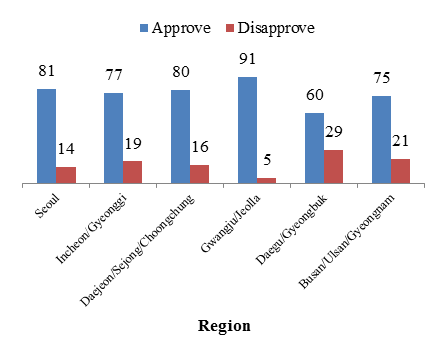 Overall, the latest poll by Gallup Korea indicates that 77% of the Korean public supported the president’s impeachment. Only 18% opposed. 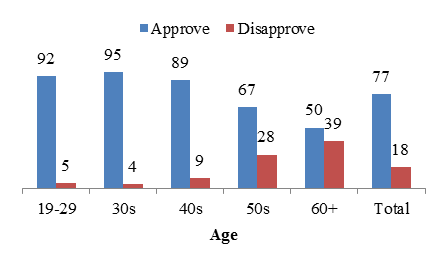 The strongest opposition for the impeachment came from over 60-year-olds with 50% supporting the impeachment and 39% opposing. There were 24 open court floor seats, which fielded 19,000 applications.4 A large crowd of proponents and opponents gathered near the courthouse. 270 squadrons of 20,000 police officers and 360 buses were deployed in and around the court.5 The Seoul municipal police department issued the highest state of alert. 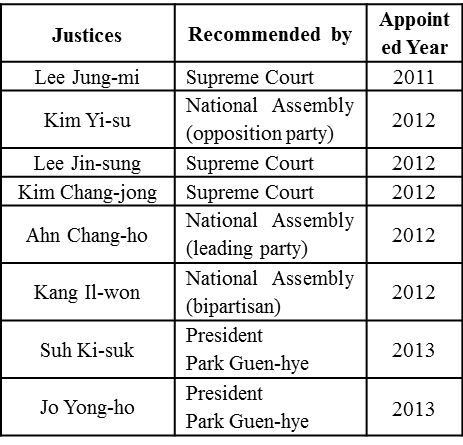 Prime Minister Hwang Kyo-ahn will serve as the de facto president until the election. According to election laws, the next presidential election must take place within 60 days (May 9) of the Constitutional Court’s decision. Also, the election date must be announced by the acting president 50 days prior to election (Mar 20). According to the latest poll, Moon Jae-in is firmly in control of the race for the Blue House. Prime Minister Hwang remains as the only conservative candidate in the top-5 although his rating might take a significant hit from the Constitutional Court’s decision. The missile test came as South Korea and the United States were conducting its annual Foal Eagle joint-military exercise, which began on Mar 1.16 South Korea also concluded the land-swap deal with the Lotte Group.17 Meanwhile the US military has also begun delivery of THAAD components as of March 6. “[전문]박근혜 대통령 탄핵 헌법재판소 선고문,” 경향신문, 2017년 3월 10일. https://www.ccourt.go.kr/cckhome/kor/ccourt/person/person.do#; “[탄핵심판 카운트다운] 재판관 보수5•진보2•중도1… “사실관계•법리원칙 따라 결론,” 서울신문, 2017년 3월 1일. “[박근혜 운명의 날]탄핵사유 1개라도 ‘헌법•법률 중대한 위반’ 인정되면 파면,” 경향신문, 2017년 3월 9일; “헌재 ‘저희는 입이 없다’… 재판관들, 결정문 초안 회람,” 조선일보, 2017년 3월 10일. “헌재는 정중동 … 거리선 ‘8대 0 탄핵 믿어’ ‘8인 체제는 무효’,” 중앙일보, 2017년 3월 10일. “헌재앞 ‘탄핵 찬반’ 밤샘집회… 경찰 ‘폭력땐 엄정 대처’,” 동아일보, 2017년 3월 10일. Gallup Korea, date: Feb 28-Mar 2; sample size 1,010; margin of error: +3.1 at the 95% confidence level. “특검, 40여명 공소유지 투입…삼성•블랙리스트 ‘자신감’,” 뉴스원, 2017년 3월 10일. “박영수 특검팀 90일간 수사, 白書로 만든다,” 조선일보, 2017년 3월 2일; “[특검 수사 결과 발표]검사 31명 ‘2기 특수본’ 출범…우병우 전담팀 꾸려,” 경향신문, 2017년 3월 6일. “검찰 수사 앞둔 박근혜, 노태우와 전두환의 길 중 무엇 택할까,” 경향신문, 2017년 3월 10일. Gallup Korea, date: Mar 7-9; sample size 1,005; margin of error: +3.1 at the 95% confidence level. “北, 동창리 일대서 미사일 4발 동해로 발사…1000km 비행,” 동아일보, 2017년 3월 6일. “합참 ‘6일 발사한 北미사일은 스커드 개량형’,” 조선일보, 2017년 3월 7일. “한•미 독수리 훈련 시작…봄 오면 ‘긴장의 한반도’,” 경향신문, 2017년 3월 1일. “국방부 롯데 ‘사드부지 맞교환’ 계약 체결,” 경향신문, 2017년 2월 28일. “중 ‘사드 배치 잘못된 길…모든 후과는 한국미국 못’,” 한겨레, 2017년 2월 27일. “중국 롯데마트에서 사드 항위 시위,” 중앙일보, 2017년 2월 28일. “중 기업들 직원 4천명 한국 관광 등 잇따라 취소,” 경향신문, 2017녀 3월 3일. “’사드 보복’ 중국, 韓 관광상품 광고 전면 금지,” 조선일보, 2017년 3월 2일. “김관진-맥마스터 美안보보좌관 통화서 ‘사드배치 차질없이 추진’,” 조선일보, 2017년 3월 1일. “한•미 국방장관 ‘北 도발에 단호히 대응…사드 부지 확보 높이 평가’,” 중앙일보, 2017년 3월 1일. “황교안 ‘사드 반드시 필요…中 반발 거세질 것 예상, 소통 강화하겠다’,” 동아일보, 2017년 3월 3일.